Stores reference 6D/105. The overall shape of the mask is really quite good and the 'flexible' flat solder bar used to shape the nose of the mask to the wearer's face also appears to be intact/complete. It is one of the rarer early pattern masks with exposed calico where the microphone mounting ring is attached. Unfortunately the cloth is peppered with moth holes, the worst of which are at the nose and right side of the mask as worn. Study the photographs carefully to acertain the extent of the extent of the damage. Please also refer to photographs 11 - 13 where the holes have been 'patched' using period material. This 'repair' work is totally non-invasive and the cloth has simply been tucked into the holes to improve the appearance. No stitching or glueing has been done and it is 100% reversible. This has been done merely to give an idea of what it could look like if repaired. The mask's chamois lining has average soiling and rubbing and just minor damage with a few small holes. The microphone mounting ring is in very good condition and complete with reference number stamped into the metal. 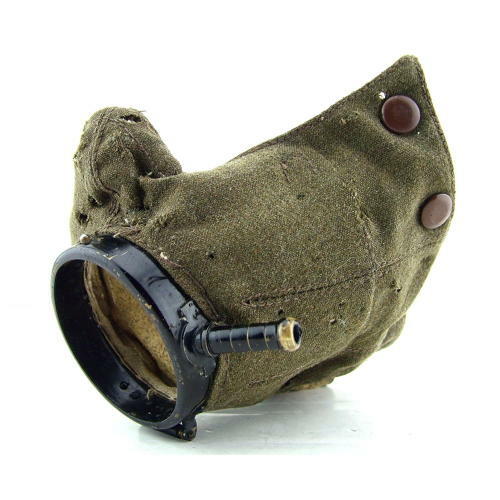 Interestingly, although an early mask, this one has been fitted with press studs for use with a modified B-type helmet or an early C-type helmet making it a rather rare variant. Not fitted with a microphone or wiring but these can be supplied at extra cost if required. A somewhat tatty example of a scarce variant of an already rare mask. We can supply some more cloth should the buyer want to make more repairs. Further photographs available on request. Stock code O22315.